A couple of days ago Andy Raingold – co-founder of Change in Nature – and myself co-facilitated a two-day Nature Immersion for a diverse cohort of leaders to explore and embody future-fit leading, shifting consciousness from separateness to connectedness, and opening up to the Mind of Nature, held within a beautiful and secluded valley in the heart of the Cotswolds. 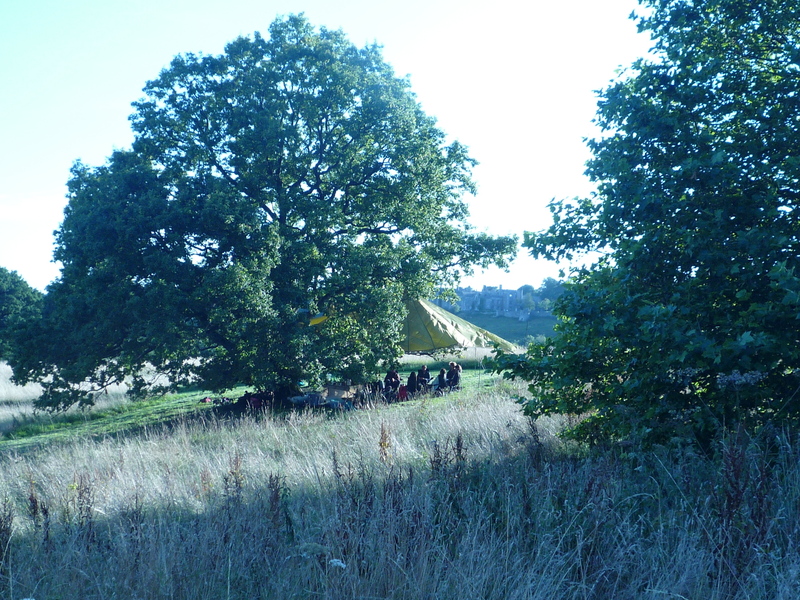 Amazingly, the wet and windy weather of August here in the UK paused to provide us with a window of sun shine and warmth for the entire two days, so the participants could embrace a 12 hour overnight solo in the woods while seeing the stars pierce the beech leaf canopy, with the moon light and early morning rays flooding the woodland, and so we could have meals, conversations and experiential exercises in the warmth of the summer sun. What gratitude Andy and I have for Nature providing the ideal conditions for this gentle yet provocative Immersion. A number of things were seeded and explored over the two days such as: the attunement of inner-outer, sense of purpose, interconnectedness, panarchy and the dynamics of transformation, the soul-dance of co-creativity and emergence, and how our ‘being-and-knowing’ informs and enriches our ‘doing’. 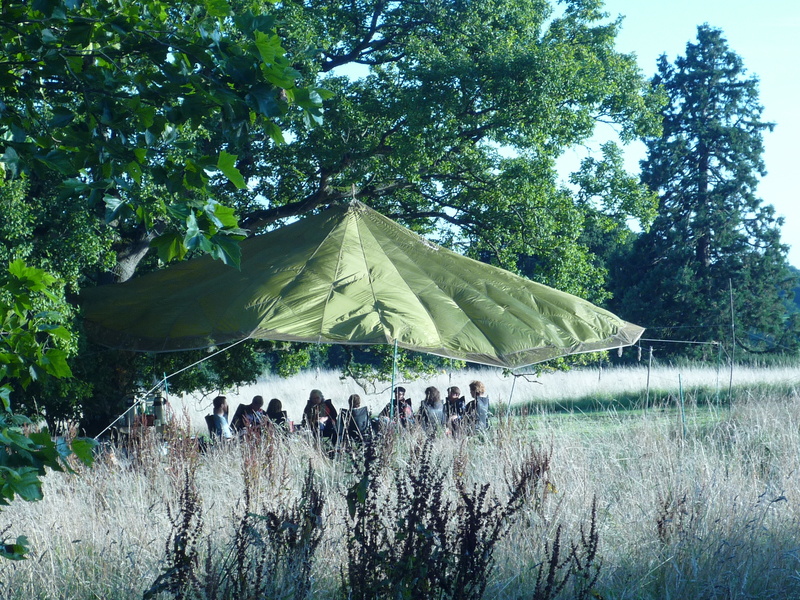 One theme that emerged early on and then deepened throughout the two-day immersion was that of music, and how we are all co-creative musicians participating in this inter-relational Dance of Life. We may learn to tune-in to this deeper music within and all around us, if we so choose to hear/see/sense deeply enough. The space between the notes is what gives the music its rhythm and depth. Likewise, creating and holding space is vital for today’s leadership and organisational development. All-too-often holding space is overlooked in today’s busyness. Stillness and space are seen as either a luxury or something to be filled-in as we get swept along with our hurry-up-and-get-on-with-it culture. This encourages the superficial and undermines the deep. This trilemma of social, economic and environmental crises now upon us demands the deep. The challenges our leaders face in transforming their organisations while keeping the wheels on the road amid unceasing change demands the deep. Our leadership ability to adequately hold space is what allows for creative tensions to be worked through, to be fully sung if you like, rather than force-fitted into hurried solutions while frustration remains. It is space that allows for the depth within ourselves to be more readily seen from the surface. When we reduce down our spaces, we commodify the music, we de-soul our work and cut ourselves off from the very well-spring we so urgently need to be tapping into amid these tumultuous times. Holding space enables a deeper, wiser consciousness to shine through from the depths within us, within our teams, within Nature all-about-us; it enhances, enriches and rejuvenates our being-and-knowing which can percolate into our relations, team dynamics, meeting conventions and decision-making protocols. Opening up these spaces allows the chi, prana, life-force, sacred-breath or ‘elan vital’ to flow more readily through our flourishing future-fit organisations. Without the spaces, the music loses its rhythm and flow. What is now clear to those of us at the leading-edge of leadership and organisational development is that a shift in consciousness in terms of how we lead, organise and operate is a must if we are to enable our organisations to flourish amid increasing complexity, shifting stakeholder demands and wicked systemic challenges. This consciousness shift is not just a shift in perspective from seeing the organisation-as-a-machine (locked-up in separateness, control and linearity) to seeing the organisation-as-a-living-system (flourishing through the living-systems dynamics of emergence, interconnectedness and synchronicity). It is also a shift in how we attend to life; a shift in our own inner-outer dynamic within ourselves and within our relations and wider social systems. This is a change in the ‘centre-of-gravity’ within ourselves and in our relations with others; a readjustment of our ego-soul dynamic – finding our true nature by tuning-in and letting it flow. It’s a shift from a prevalent focus on the outer, on the doing, on the presentation ‘out there’, and the goal orientated achievement to grasp at something out there driven by a mechanistic, linear cause-and-effect perspective. Polished brands, quarterly numbers, cascaded KPIs, data upon data upon data, goal-orientated agenda-driven meeting protocols, explicit measurable learning objectives, performance-driven metrics, are all part-and-parcel of this mind-set. And there is nothing wrong with it per se. It has its useful place, and serves a purpose. The problem comes when this mechanistic mind-set dominates our modus operandi; then we wind up overly emphasising the ‘outer’ at the expense of the ‘inner’, the implicit, the unconscious, the liminal and intangible thresholds beyond the known; then our systems of learning and development prioritise the very logic that created our problems in the first place. Trying to fix our sea of challenges with the same consciousness that created our problems is not what future-fit leadership is about. In fact, future-fit leadership is a radical departure from this, and it’s not for the faint-hearted who would rather the security and superficiality of the status quo any day. Hence, we need to shift this inner-outer dynamic first within ourselves and then through our relationships, conversations, meeting conventions and such like, and also beyond our organisations into the interconnected eco-systems, so that ‘space’ is brought in and not left out, so that we bring in a more balanced, more holistic, more human attentiveness. This is the intention and attention now called for. It requires courage to depart from the prevalent thinking of the day and the restless pressure for the concrete cause-and-effect, neatly definable, packaged up metrics, models and methods. It is through ‘space’ that we may allow for an embodied shift in consciousness to occur if only for brief moments to begin with. It is through space that we open up to deeper ways of being-and-knowing. Elsewhere I refer to this shift in being-and-knowing as crossing an ‘ontological and epistemological’ threshold. It is this threshold that takes us beyond the conventional mechanisms into post-conventional aliveness. The simplicity of the complexity is this: if we are to thrive as future-fit leaders and organisations we need our inner intuitive awareness – our ‘sacred gift’ – to inform our outer doing. As then our outer doing is in service of this deeper wisdom. It is by creating empty spaces in our day-to-day that we allow ourselves to connect deeper within, and realign our inner-outer dynamic amid the busyness of our business. These spaces help us cultivate our self-awareness while also allowing natural creativity, discernment and authenticity to emanate from deep within us into our thoughts, words and deeds. The art of future-fit leading is in learning to allow our daily ego-consciousness to permeate more readily with our sub-conscious and super-conscious minds, and with the Mind of Nature. We allow the formlessness within the Mind of Nature to inform our form. We allow the ‘pattern that connects’ (to use Gregory Bateson’s term) to open our perceptual horizon into the interconnectedness of our own humanity and deeper more-than-human world we are always immersed within. The trick here is to begin to realise that mind and matter are not separate. The separation of mind and matter is the root-flaw at the heart of our corrupting and carcinogenic worldview that creates plastic islands in our oceans, fear-filled newspapers, stress-creating workplaces and run-away climate change. By opening up more deeply to our natural ways of being-and-knowing, we give ourselves and our fellow stakeholders the invitation to dive-in to the heart of the problem and remedy it at source, with our own awareness and attentiveness. As leaders, we have to create space for ourselves to tune-in, AND also hold space for our teams within our organisations and wider inter-related network of stakeholders. It is about helping others more readily call upon their deeper ways of being-and-knowing. Then we allow our organisational living system to sense-and-respond more effectively in times of unceasing transformation – it’s simply good business sense. And yet its more than that, a lot more than that, it’s about helping us wake up to who we truly are as wise beings in a deeply wise world – to rekindle our true humanity. It is this creating and holding space that provides the nutritious soil from which our flourishing future-fit organisations are rooted. Without this vital spaciousness, a shift in consciousness remains elusive, and we miss out on the music of what could have been. Nick Udall makes an important point here in that there is a third step required: after the first step of self-emptying or presencing, and the second step of holding space for others to tap into a deeper way of being-and-knowing, the third step is to provide the right environment for creative tensions to turn into music, to reveal deeper insights, rather than being closed down with quick knee-jerk solutions that fill the uncomfortable gap of not-knowing. This going into the not-knowing while tension-is-in-the-air requires vulnerability, humility and courage. Today, we need leaders who can open up these tensions so that deeper emergence, deeper learning, deeper insight can spawn. Holding space during these tensions allows a deeper rhythm and wiser music to emerge through the space between the notes. In a world full of noisy notes it requires courage to hold this kind of gentle yet provocative space. It requires vulnerability to look beyond tried-and-tested neatly packaged tools into a wilder wisdom born from within. It requires humility to move away from hubris and ego-knowing into not-knowing, into surrendering, into crucifixion, so that our personal will can become subservient to a deeper wiser will of Nature within ourselves, within our teams, within our business ecosystems and social systems, and within our more-than-human world. We might begin to glimpse the deeper purpose of life that informs our specific individual purpose and organisational purpose, the quest for harmony and wellbeing through love and wisdom. This goes against much of what we have been taught at school, and also in our further education establishments, business schools and management training courses, and yet it is this humble and gentle opening up to a deeper consciousness within and all about us which ourselves, our systems and our civilisation now needs. And there is a fourth step. After (1) creating space within ourselves to sense into the deep matrix of Nature; after (2) creating space within our conversations and meeting conventions for others to open up more readily to this matrix of Nature; after (3) creating space for creative tensions to reveal the deeper wiser music of authentic creativity, innovation and flow; we expand into (4) creating space for diverse stakeholders to come together, connect, tune-in, share and spark off each other – people from different silos across the business and from different stakeholder communities beyond the organisation come together. In celebrating this diversity and the tensions and differences it brings, we harness yet more music, more creativity, more insight, and more possibility for synchronicity. A crucible, a mixing vessel, a womb, a cauldron, a chalice, is held by us so that alchemy can be done. What emerges from the co-creative tensions moves us beyond transactional cause-and-effect relations into synergies of inter-relationalities. Here we sense synchronistic pathways; we call forth the emerging future within the presence of the Now. Our openness and vulnerability to the emptiness, the void of not-knowing, opens us to the quantum plenum, the ground-of-all-being, the Way of the Tao, so that we can sense-and-respond with wisdom. It is here that we allow our living organisations to flourish amid uncertain futures, to find the flow of improvisational co-creative music that gives the living system its niche amid a sea of interwoven dynamics, and the creative and destructive ebbs and flows of life. This is flourishing future-fit business realised through future-fit leadership. Pranayama – this is a form of mindful breathing. We are always breathing, so it’s a great tool for bringing ourselves back to the space-between-the-notes. Pranayama is the foundation for yoga (Union with God). Essentially, it’s mindful breathing exercises through alternate nostrils. It increases our prana (or ‘life force’) throughout our bodymind. It is an easy and quick way to allow our ego-consciousness to permeate more readily with our super-consciousness while improving general wellbeing and coherence. Mindful walking and listening – we regularly walk about, moving our arms and legs, pressing our weight down with each step. By becoming more conscious of our walking, its pace and style, the space between each stride, the legs coming up and down, the arms swishing from side to side, we can become more mindful, more in the Now, and cultivate spaciousness within our awareness. Likewise, we often find ourselves listening to things, to what is going on around us now. By becoming more conscious of what we are hearing, we can start to listen more mindfully. To listen to sounds, voices, sentences in a freer less judging or impatient way. As we listen, we can notice the feelings that are evoked within us by the sounds around us during the everyday. Often we are so ‘in our heads’ that we do not adequately attend to the sounds around us, and what lies beyond the words. Make space – your calendar, your schedule, your way of working is up to you to define. We often find ourselves enslaved to activities we have filled up our diary with, usually meeting after meeting. By blocking out at least 90 min slots every so often (for instance Monday after lunch and/or Friday after lunch) for ‘empty space’ just to walk, sit, breathe, deepen, we begin to take back control of how we are being-and-knowing. During my time as coach and adviser to senior executives, CEO’s, Chairs, Heads of Strategy, and such like of fast-moving organisations, they often struggle with this suggestion, as they feel they simply don’t have time for this. Yet, when they do begin to try it out, it soon becomes their favourite tool, as they soon realise it’s in these spaces that they gain insights that provide effectiveness to the busyness. This time-out actually saves time and rejuvenates us in the process. Simple and wise. Purpose check-ups – recently I got to spent time with the New York Times best-selling author on purpose, Richard Leider and his wife, what a lovely soul-pair. Over his thirty years exploring purpose with senior executives he has learnt the importance of regular purpose check-ups, space we create to deeply reflect on our purpose to tune-in to our way-of-being, and of how we are delivering our purpose into the world. This can be a half day check-in, or a day, or up to five days. Time spent in nature with our handheld devices switched off is by far the best way for these purpose check-ups to work their magic. Silence – a minute’s silence at the beginning and the end of every meeting is an easy thing to introduce with no business case sign-off required. A fast-moving media company who recently introduced this practice noticed positive effects in the quality of decision making within a couple of weeks. Sharing – check-ins at the beginning and end of every meeting, where we share how we are feeling, and share any tensions or insights in an open-hearted way, is again a powerful yet easy way to create spaciousness during meetings. Deep listening – by regularly practicing deep listening, we help enhance our awareness of how present we are being during our conversing. We consciously practice heart-felt sharing while becoming more mindful of the quality of our listening. Are we listening through our filters or are we more fully presencing and therefore contributing to a deeper generative space of dialogue and emergence? Again, this is a simple practice we can bring into our meetings without the need for business case sign off, just the courage to hold the space. Different types of meetings – Nick Udall speaks of the need for operational teams, strategic meetings and creative meetings. Creative meetings provide space for sensing into the unknown, ‘to wander with wonder into the unknown.’ Most of our daily meetings are operational and provide little space for such wandering. In fact, we might find ourselves perceiving such wandering as inefficient and ineffective, a sign of how inured we have become by mechanistic thinking. As leaders we can consciously reshape our meetings so that we bring in more of these creative meetings. Non-violent communication methods – much of today’s communication in business is tinted with judgement, demand, diagnosis, polarisation into right versus wrong. NVC and other forms of dialogue are more than communication techniques; they transform our relationships into more spacious communions. Essentially, we allow our conversations to connect though empathic listening and speaking. We can revive lifeless conversations and meetings and allow generative spaces of deeper being-and-knowing to spawn. Way of Council – Through the ancient practice of Way of Council groups of people come together to share within a communal atmosphere of non-judgment and acceptance. In Council, people sit in a circle and commit to being fully present, freed from distractions, judgements or opinion forming, listening intently and sharing open-heartedly with each other without preparing or rehearsing our responses. As we go round the circle we not only deepen our sharing, we also help form a social field of empathy which enables us to share more deeply as we go round, deepening our heart-felt sharing into the void of not-knowing, whereupon real insights rise up. Art of Hosting – this is a powerful approach for leading in complex and challenging situations. It suggests that those leaders who are able to listen to and draw upon different perspectives, and to strengthen connections between people and organisations through dialogue, will be able to bring out the best in those whom they are leading. 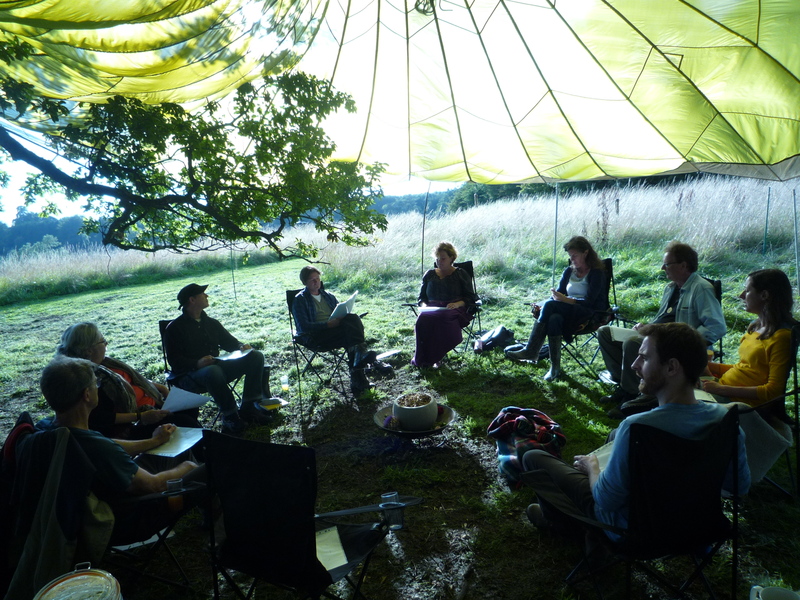 It is a free, open and self-run method where people self-organise around circles discussing It blends a suite of powerful conversational processes to invite people to openly share and explore tensions. Artful Interventions – Regular interventions of artful expressions help us share our own tensions, fears, vulnerability, experiences and learnings that are hidden within us beyond verbalization and brainstorming. Freud, then Jung, and now James Hillman, as well as other great psychologists, have discovered that the psyche is imaginal and by relating with the images that come up through our unconscious into our conscious mind through artful undertakings – such as dance, drawing or sculpting – we can get closer to interpreting the image, feeling its insight within us and so opening up to this expression emanating from what we have experienced yet cannot rationalise. Social Presencing Theatre, Applied Improv, Contact Improv, and so forth are being used more and more by organisations seeking interventions that bring out tensions at personal, team and system dimensions. Such artful practices can explore specific themes that need addressing, they can also act as one-off disruptions as part of a transformational project or as part of a specific creative process (helping us move more fluently from open and closed states of mind while working on innovative ventures). Whilst reflecting over the two day immersion and all the relations that formed and deepened, I have found myself sensing into a key theme – the importance of our future-fit leaders being able to adequately hold space, to lean into their own deeper ways of being-and-knowing: an ‘extended epistemology’ where our daily ego-consciousness permeates more readily with that which lies beyond, into our emotional intelligence, spiritual intelligence and the Mind of Nature. For leaders, this also comes with a courage, compassion and conviction to adequately hold space for others to deepen their being-and-knowing amid the everyday working environment.